Television Time, the best TV show tracker, has a really useful feature that allows you to set up custom notifications for new episodes of shows you regularly watch. To do this, go to Settings → Notifications → Enable Notifications. The Notification Offset feature is the really useful part. 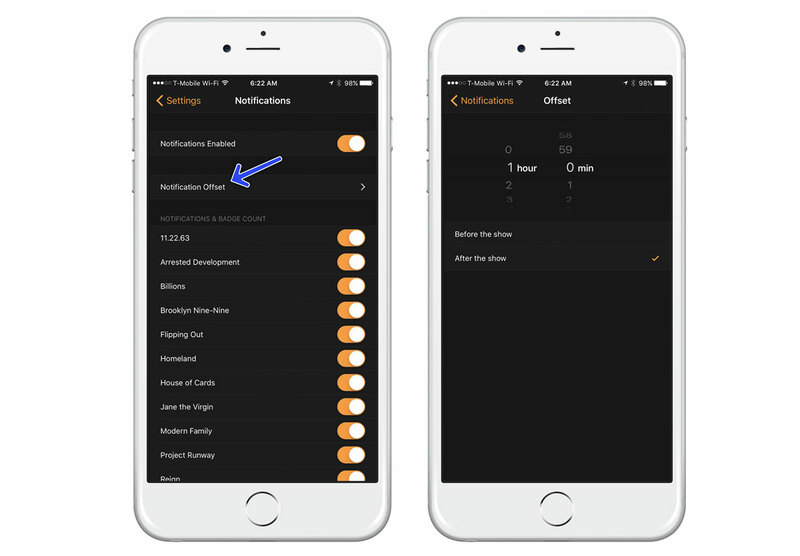 Tap into this setting, and select how much offset notifications should lead before or follow after an episode airs. If you only watch shows on your DVR, being notified at the airing time isn’t very useful. I currently have mine set at one hour behind. This allows you to only be notified one hour after the show has aired. I’d love to see this customizable per show. This is also useful if you’d like a notification before the show airs if you’re planning to watch it live.